This seems implausible and a little too fantastic to be believed: I go to an island, I find a kitchen store, in the store I find a book, and inside the book is a message telling me where to go for dinner tonight. It is dusk on Nantucket, the end of an almost perfect day: sunshine and blue skies with no wind. It’s not just any day though; it’s the 4th of July (1988) and my son, Greg, and I are here on a day trip to explore the island. To top off this picture-perfect holiday, we are cruising in a taxi to the far Eastern end of the island, headed to the Sconset Café for an early dinner before we have to catch the ferry back to Hyannis. I didn’t really know anything about this restaurant until this morning when, browsing through a now closed kitchen store called “The Complete Kitchen” (no matter where I am, I always find a kitchen store—oh, and also a book store), I see a sign that catches my eye: “Cookbooks by Local Chefs”. As I pick up one of the books, a little pink spiral-bound book with seashells on the front, I instantly recognize the name of the chef, Pamela McKinstry, as the creator of the Morning Glory Muffin which happened right here on Nantucket when the chef owned an earlier restaurant by the same name. I am intrigued because I have been a fan since seeing her muffin recipe printed in Gourmet a few years earlier. When I open the book and start reading “About the Author” on the first page, I realize that she currently has a “village café” on the island called the Sconset Café and I tell Greg then and there that this is where we are going to have dinner tonight if it is open. I add “if it is open” because it is July 4th. With much anticipation, we arrive at the restaurant, which is covered in weathered gray shingles, reminding us that we might be near a beach. Everything about it adds to the description of what a “village café” should be. It is casual and friendly; the people inside are very welcoming. And then there’s the food; it’s all very fresh and delicious. We are having a great dinner, chatting about everything we did earlier in the day. We are just talking about how lucky we are to find this place when the dessert arrives. It is Blueberry Créme Brûlée. I notice the rich deep color of the caramelized sugar on top. The caramel is not burnt nor is it too light; it is a perfect color that matches the day and the dinner. Plump blueberries are visible through the sugar and are giving off their purple juices. As we take our spoons and crack the tops, we are both mesmerized by the creamy cold custard underneath that mixes with the squish of blueberries and the crunch of caramel as you taste it. As my son put it in an email “it just seemed like a moment in time, you and me and crème brûlée”. This chance visit to the Sconset Café (which still exists under different owners), the unforgettable dinner and the Blueberry Crème Brûleé that was so memorable happened twenty-seven years ago when my son, Greg, and I took the ferry to Nantucket for the day. We had a great time, but the thing that we both remember most from that day is the dessert at the Sconset Café. 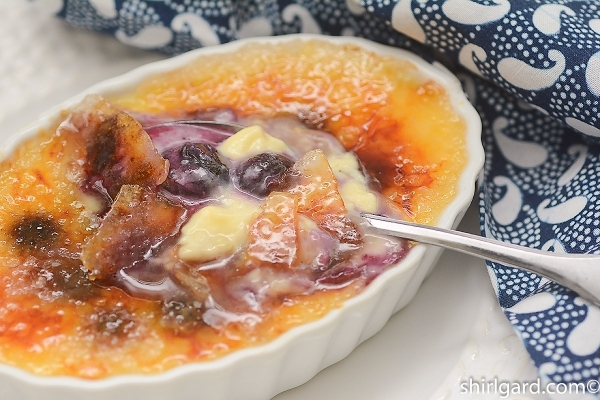 We still talk about the experience and rhapsodize over the Blueberry Crème Brûlée. Split vanilla bean, keeping knife parallel with cutting board. Scrape out seeds with dull side of knife. 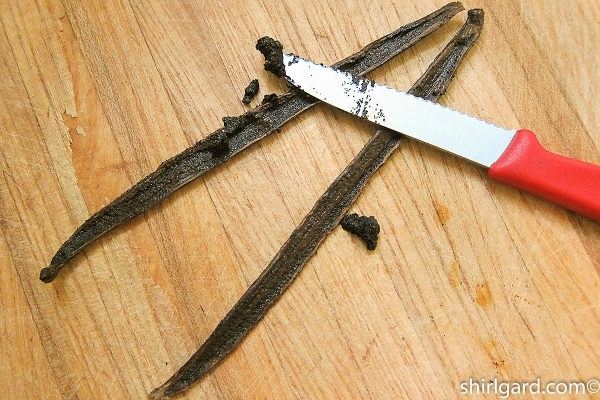 Heat cream & vanilla bean seeds & pod. Cover & let steep. 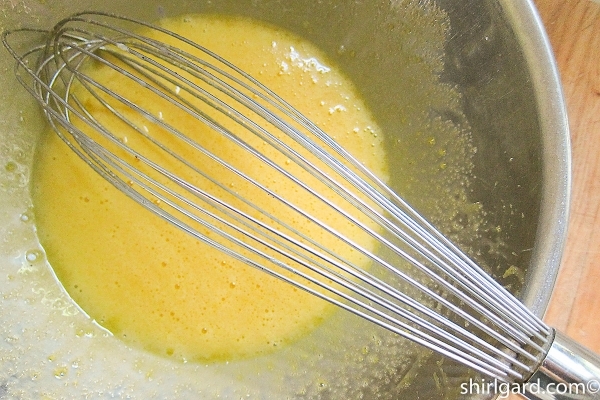 Whisk eggs & temper in cooled cream. 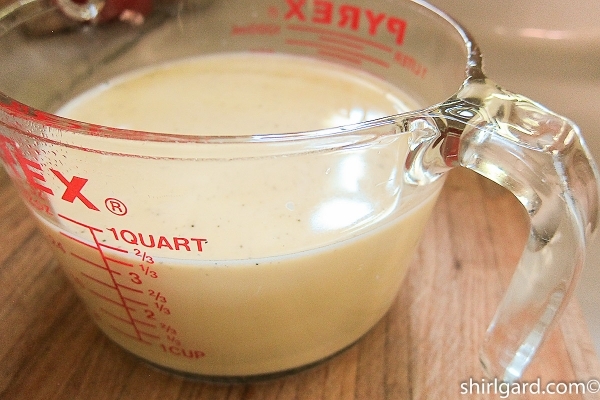 Use a 1-QT measuring cup with spout to fill dishes. 30 grams (1 oz) blueberries per 5-oz dish. 1 1/2 Tablespoons superfine sugar; spread to edges. Caramelize the sugar using a propane torch. Crack the caramel with your spoon. 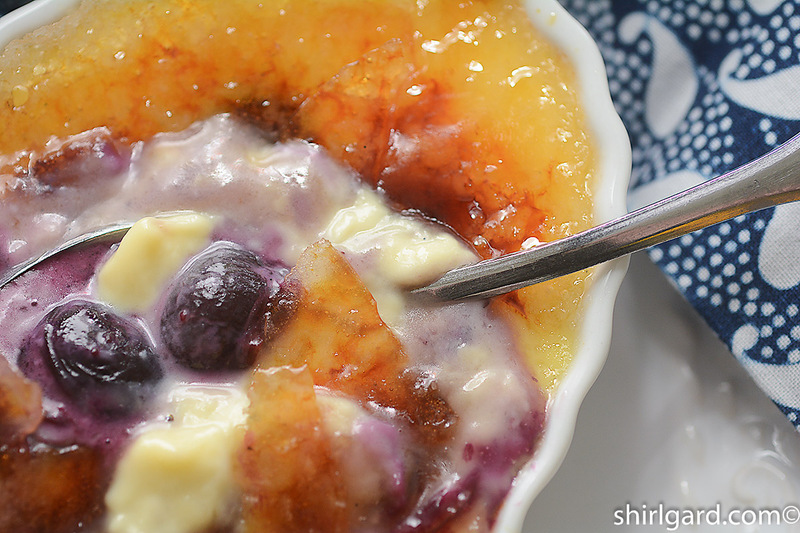 Custard, blueberries, and crunchy caramel. 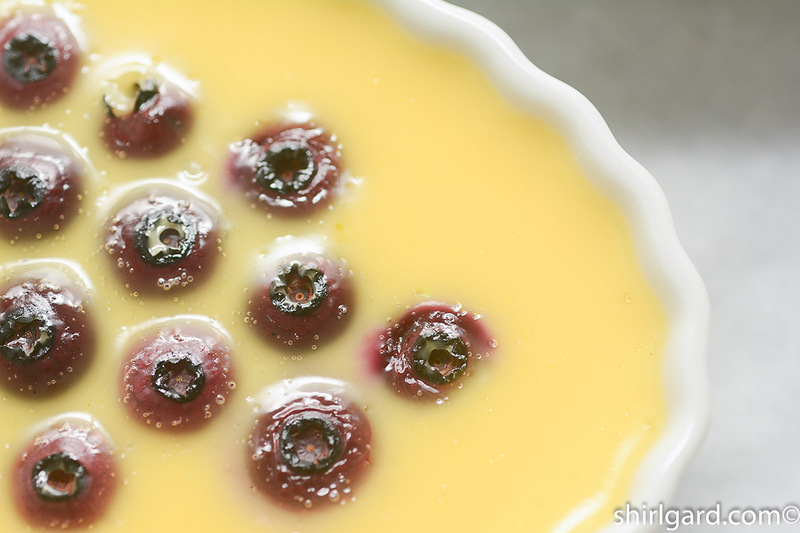 Here's how I would describe this dessert: slow-baked blueberries suspended in a creamy, silky-smooth custard with a topping of golden caramel. A spoonful releases all at once a burst of blueberries mixed with the custard and the crunch of caramelized sugar. 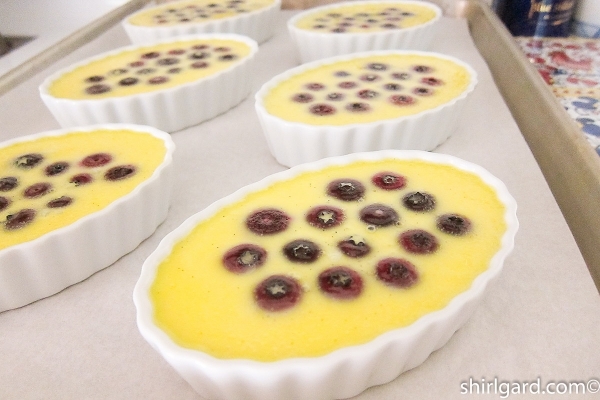 I use a simple low-oven-temperature method to bake these custards. This streamlines the making of crème brûlées by eliminating the need for a water bath, which is an annoyance for many cooks, including myself. 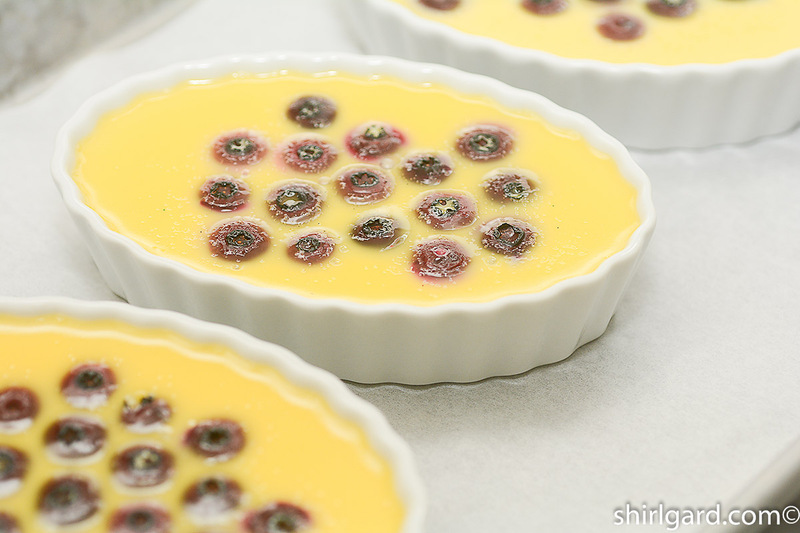 You can make the custard and bake immediately if in a hurry, or refrigerate overnight before baking, which improves the flavor. Either way, the baked custards need time to chill (a few hours) so they can be served cold, with freshly brûléed tops; plan to make early in the day or the day before. You will need a propane torch from the hardware store (or a fancy one from a kitchenware store). 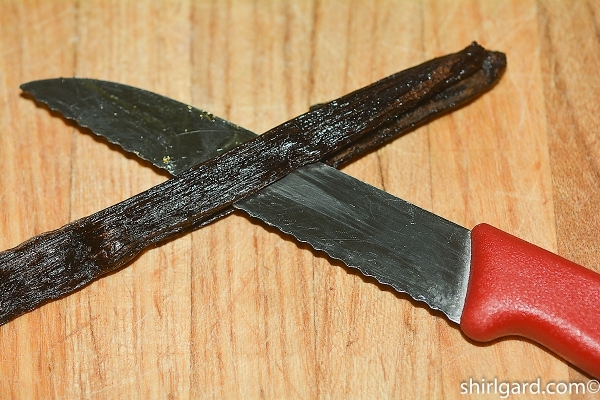 SUPERFINE SUGAR FOR BRÛLÉEING THE TOPS: About 1½ Tablesoons per dish. COVER and allow the vanilla bean seeds and pod to steep in the hot cream for 1 hour. WHISK the egg yolks and other half of the sugar just enough to liquefy and smooth out; whisk cooled cream into the yolks. 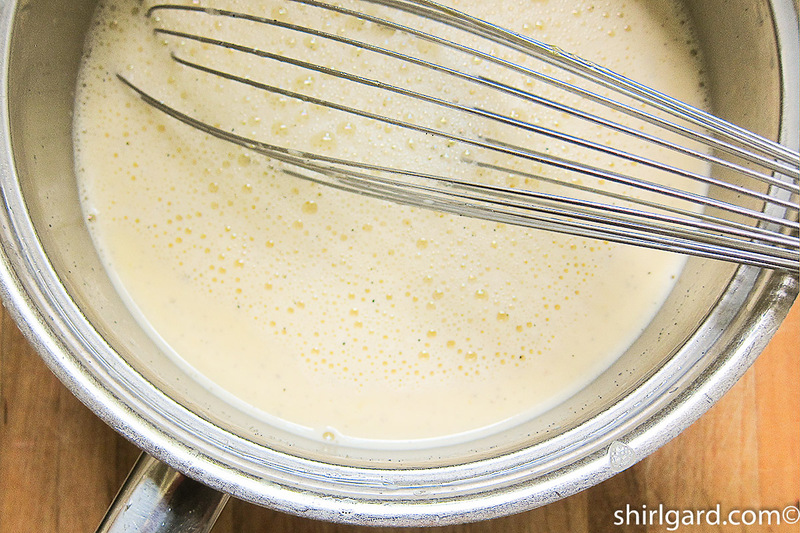 STRAIN the custard through a chinois or a fine mesh strainer and skim off any foam. Bake immediately or chill in the refrigerator overnight, or until needed. The custard will keep 2 or 3 days in the refrigerator. 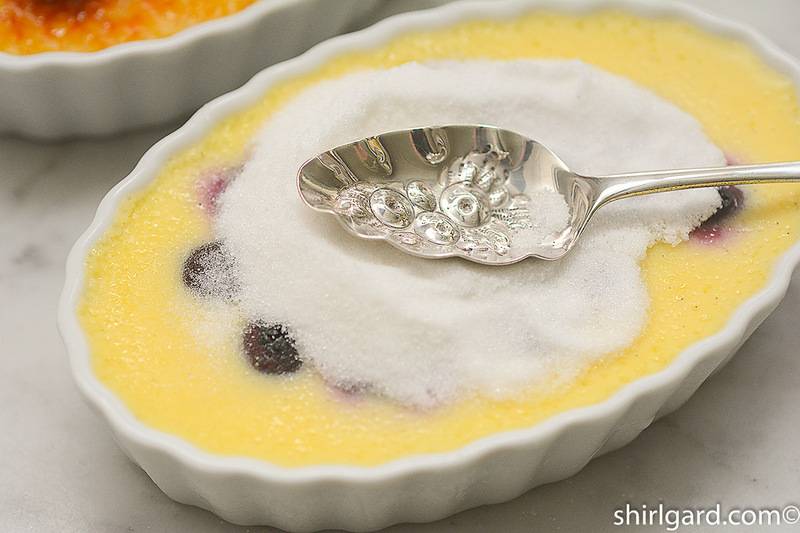 ARRANGE brûlée dishes on a parchment-lined sheet pan next to the stove when ready to bake. Filling the dishes next to the stove or on top of the stove saves spills; it's hard to carry a tray of liquid-filled dishes acrosss the kitchen without spilling. 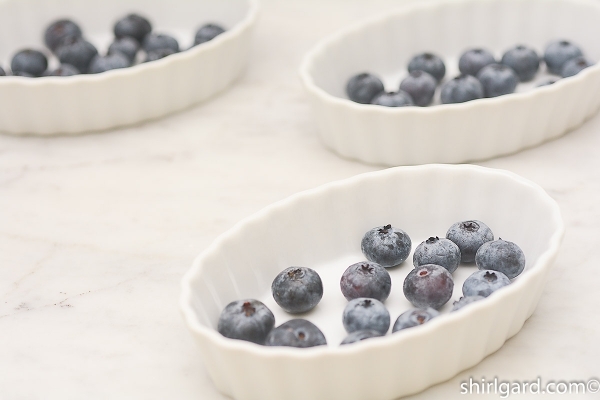 DISTRIBUTE the blueberries evenly in the dishes, 30 grams (1 ounce) per dish. 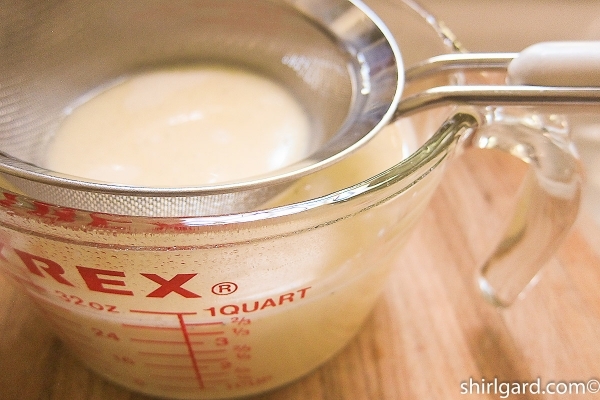 POUR custard mixture into dishes using a four-cup measuring cup with a spout: 120 grams (1/2 cup) per dish. Make sure that all blueberries are evenly distributed and submerged in the liquid. Use a torch to dissolve any bubbles or foam on top. BAKE at 225°F (107°C), approximately 1 hour. Watch very closely towards the end of baking. The custards should be set and not "jiggly" in center when you gently shake the pan. Remove from the oven while they are still very smooth and shiny, and in bakeshop-speak, before they start to soufflé (bubble up) around the edges. You want very smooth tops. 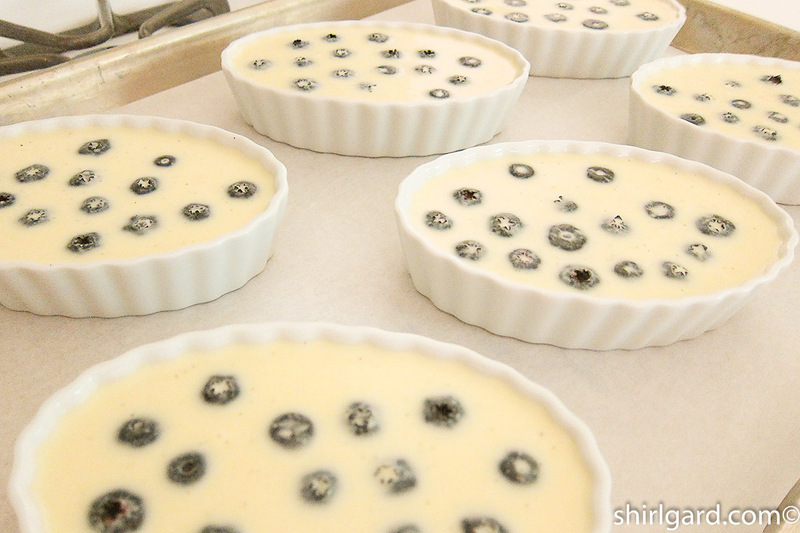 COOL to room temperature and then refrigerate the custards several hours or overnight. WAIT until just before servig to brûlée the tops. 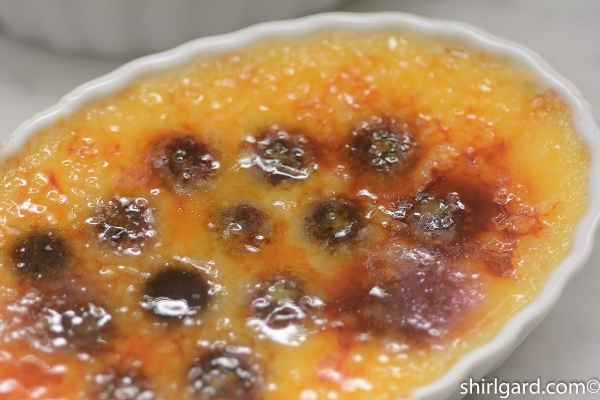 BRÛLÉE THE TOPS: If the custards have condensation on top, blot dry with a paper towel before spreading on sugar. Place 1½ tablespoons of superfine sugar in the center of a dish of cold custard. Using the back of a teaspoon, spread the sugar gently to the edges in an even layer, without splashing sugar on the rim of the dish. Just in case, clean edges of the dishes with a damp paper towel. Using a propane torch, caramelize the sugar until melted and a rich caramel color. Do short bursts of flame and if one area is getting too dark or starting to burn, lift the torch away for a few seconds and then return. Continue until the top is evenly caramelized. This recipe is loosely based on a recipe given to me by Steve Durfee (6/9/94), the former pastry chef at Alison on Dominick in New York and at Wheatleigh; Lenox, MA. 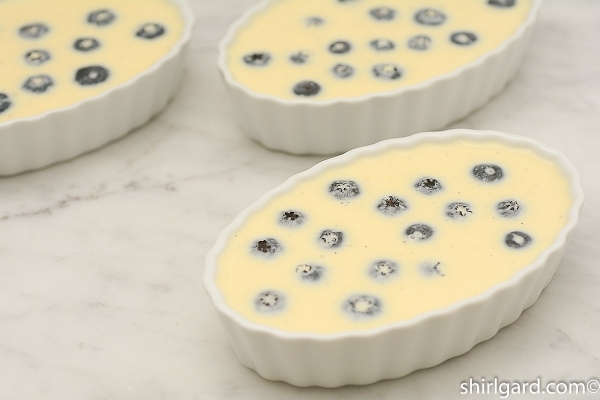 Because the blueberries give up some of their liquid during baking, I added another egg yolk and cut down on the liquid to create a little tighter custard because the regular formula seemed a little "soupy" with blueberries. 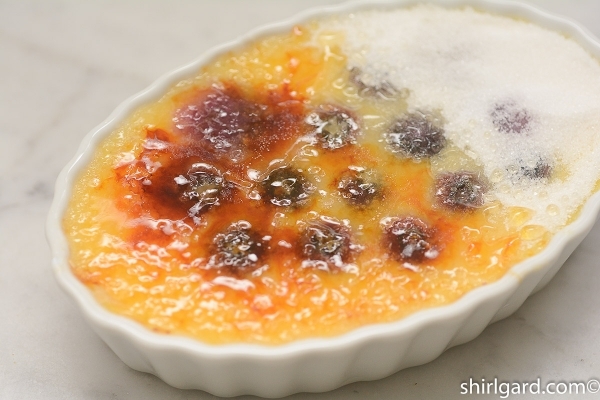 Although it is not a novel idea to put blueberries in Crème Brûlée now, I was first inspired to do this after a dinner I had with my son, Greg, at TheSconset Café on Nantucket (7/04/88).